What better than an online seder potluck (no calories!)? And who better to host it than Tori? Thank you so much for inviting me to your virtual table. Bakeries have fascinated me forever, it seems, since those magical Sunday mornings in the years following World War Two, when my Dad and I would go, hand in hand, to buy bagels, bialys, a rye bread – and maybe, on special occasions, a half-pound of cookies in a white cardboard box, tied with candy-striped string. Those memories are precious, and to preserve them, Norm Berg, a retired baker, and I wrote Inside the Jewish Bakery: Recipes and Memories from the Golden Age of Jewish Baking. Like Tori, our work was honored with a 2012 IACP award. Passover is a challenge for any baker, especially those who earn their livelihood from their craft. Back when Jews lived in close-knit neighborhoods and you could find a great bakery every few blocks, most closed their doors for Pesach. Still, a few stayed open, even though it meant going through the rigorous process of bedikas chometz – purging the bakery of every last atom of leaven. For the next eight days, everything they baked was not only every bit as good as their rest-of-the-year cakes and cookies; they were also kosher for Passover! Of those hundreds of bakeries, barely a handful have survived the dual onslaught of mass-produced industrial baked goods and the assimilation of their customers’ children into the American mainstream. And of those few, the number that stay open for Passover can be counted on the fingers of one hand – if, indeed, they can be counted at all. Instead, most American Jews depend on store-bought Passover baked goods, which, frankly, leave something to be desired, especially when you compare them side-by-side with those bakery treats. 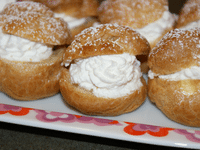 Norm and I were able to preserve many of the old-school recipes, including this one for Passover eclairs and creampuffs, which uses a pâte à choux made with matzo cake meal instead of flour. The shells themselves are pareve, meaning that they go equally well with both sweet fillings, like custards and whipped cream, and, in larger size, with savory dishes like chicken Tetrazzini and beef bourguignon. In fact, pipe them small, say ½” in diameter or less, and you’ll have light, crispy Passover soup nuts, which offer a nice alternative to matzo balls. Bon appetit and chag sameach!! Combine the oil and water in a saucepan and bring to a boil over medium heat. Add the salt and matzo cake meal, stirring constantly into a smooth paste. Transfer the paste to a mixer and mix at low speed until cool, 3-4 minutes. Add the egg in a thin stream, continuing to mix until the paste is smooth and well blended. Line two sheet pans with baking parchment. 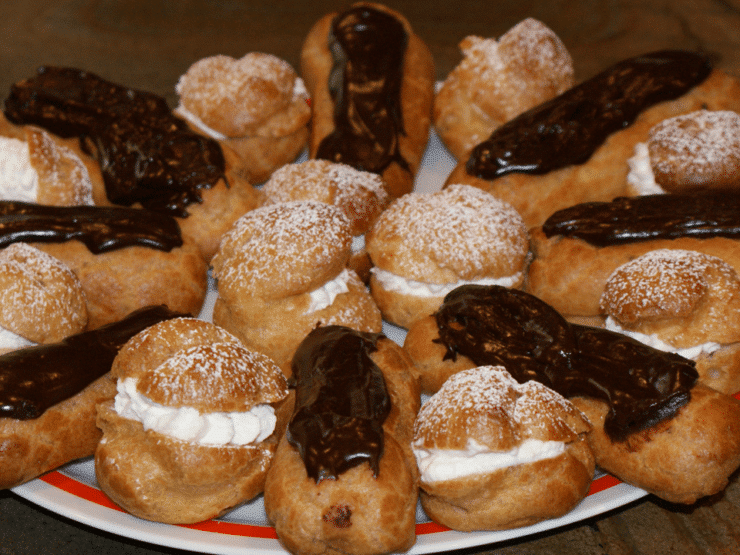 Using a pastry bag with a large plain tip or a plastic bag with a corner cut off, pipe 1"-1½"diameter balls for cream puffs, or ½” x 4” sticks for eclairs. Space them about 2” apart and gently press any peaks down with a wet finger. Bake in preheated 425° oven until the shells have puffed and browned and are completely dry, 20-25 minutes. Make sure they're baked fully; otherwise, they’ll collapse. When cool, fill with whipped cream, Kosher for Passover pudding or Passover Custard Filling (see below) and top with chocolate icing or cornstarch-free powdered sugar. In a saucepan over medium heat, combine sugar, salt and 1 cup of milk. Bring to a boil and remove from heat. In a bowl, dissolve potato or tapioca starch into remaining 1 cup of milk. Add beaten eggs, whisking until smooth. Add the egg mixture to the hot liquid in a thin stream, stirring constantly, and return to medium heat. Continue stirring until the custard thickens, 3-5 minutes. Remove from the heat, stir in butter and vanilla extract. The custard is ready to use when it reaches room temperature. Just wondering whether regular matzo meal can be substituted for matzo cake meal? None of the stores around here sell cake meal. Thanks! Hi Lisa, this isn’t my original recipe but generally when a baked good recipe calls for cake meal vs. matzo meal, I do not recommend substitution as it can really throw off the texture. Can you use non-dairy creamer or almond milk in place of regular milk? This recipe sounds great. I live in Israel and margarine is kitniyot here for us Ashkenazim. I, too would like to keep the recipe pareve to be served at either a meat or dairy meal. Can oil be used place of butter/margarine and what quantity? Thank you in advance for your assistance. what you could try to do is use the solid part of the palm oil. if you use regular oil, the custard will probably be runnier than with butter. or just make this milchig and go with butter. there’s plenty of that for pesach. Would tapioca or the potato starch act as a stabilizer for a whipped cream cake icing? If not would your recipe make a good icing? The tapioca and/or potato starches can be used wherever starch is called for in a recipe. I personally don’t use stabilizers in my whipped cream. The custard recipe produces a very stiff product, like the custards you find in doughnuts and, well, eclairs. I’m not sure I’d use it as an icing. I much prefer a ganache (chocolate chips + heavy cream) or, if I’m going pareve, a buttercream made with vegetable shortening and non-dairy butter flavoring. Just made them and they are perfect. Great recipe – thanks again. Always nice to hear that our recipes work as described. Thanks so much for the validation!!! Great recipe. Can you make the bake the puffs ahead and then fill it before serving? This would be great except that pesach meals tend to be meat and no dairy, and regardless of whether families keep kosher, this is the one holiday where most adhere to that rule. Wow – these look delicious! I am the new family holiday baker, now that my grandmother has passed. While we love her cake recipes, this would be a nice surprise. First, I love your blog/website! When I saw this post, I thought I heard angels sing!! My birthday falls during Pesach this year,and I have been trying to decide on a dessert to make for our Seder meal…I think this will be great! Thanks so much! Chag Sameach! Would it make a big difference if margarine instead of butter were used? Most of my meals on Pesach are meat. There seems to be quite a bit of dairy selctions posted on various blogs.